Don't you wish that your favorite website had a mobile application that looked and worked the same on your tablet and phone? They can -- if they use "responsive web design." Responsive web design ensures consistency across every device and every screen size. And this is particularly important when you're under stress and time constraints - like your business travelers. They need technology that increases their productivity out on the road - not something that frustrates them. ease-of-use and mobile features for receipt capture, on-the-go expense reports, and corporate card integration. Chrome River makes it easy to minimize expenses, assure compliance with travel policies, and reduce the time and cost of handling expense reports all while providing a first-class user experience. 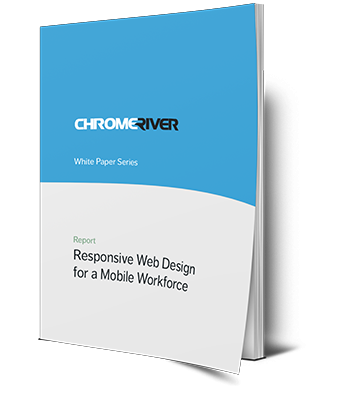 Your employees won't even realize you're giving them the latest responsive web design tools - they'll just think Chrome River is fun and easy to use - and so much more efficient than photocopying receipts and printing out spreadsheets. Download the report using the form to the right and see if the findings match up with your organization. And when you're ready to learn more, we're here to help.